When you want to revisit one of the most popular comfort foods adding new flavors to the recipe. Even the most classic dish can be reinvented with a pinch of creativity and the desire to experiment with imaginative combinations. Because in the kitchen, boredom is fought by proposing new recipes, to amaze diners and to win the monotony of lunches and dinners always the same. 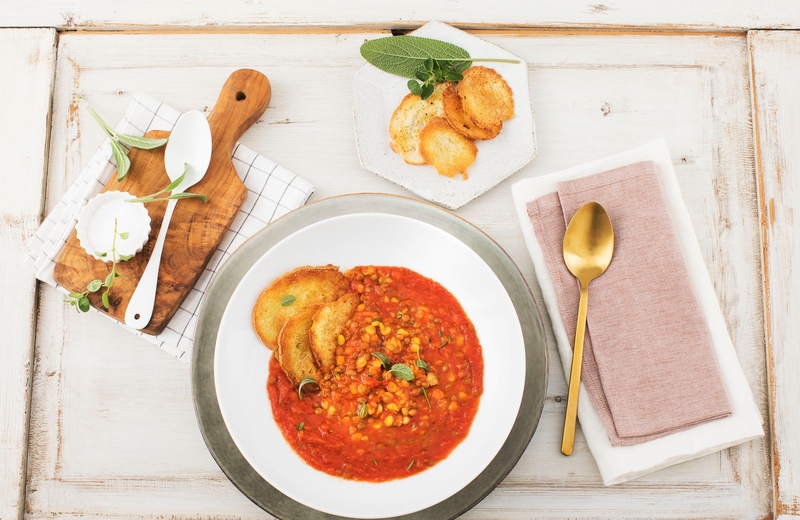 Here then is the lentil and cicerchie soup, a recipe of the Mediterranean culinary tradition, it again disguises itself and is enriched with taste thanks to the addition of Mutti Classic Sauce, with a simple and balanced flavor, and a pinch of "nduja. How it was possible to transform this classic recipe into a modern and innovative dish? We will explain it to you step by step in today's recipe, easy to make but that will give a different "twist" to your palate! Boil the lentils and grass peas in abundant salted water scented with sage and rosemary for up to three quarters of cooking and then drain the vegetables. In a steel pan put a dash of oil, a clove of garlic, two or three bay leaves and let it cook for a few minutes, then add the Mutti Classic Sauce. At this point add the legumes and a teaspoon of ‘nduja and cook for about 15 minutes adding 500 ml of water. Serve with crispy homemade bread croutons. When tradition is enriched with new flavors! Today's story brings to the table the modern reinterpretation of a dish of our tradition, lentil and cicerchie soup. To give a flicker of innovation we added to the soup a teaspoon of ‘nduja, firm and unusual note, which will not fail to amaze even the most reticent palates of change. But it is not the only novelty. To enhance this original combination of flavors, we let the legumes, cooked previously with garlic and bay leaves, flavor in the pan with the Mutti Classic Sauce, from the simple but genuine taste because made with a few simple ingredients: Mutti tomato, a beaten end of onions and basil, extra virgin olive oil. We suggest you try it because it is a quality product, reliable and tasty, perfect for seasoning pasta but also ideal for personalizing your dishes and for adding practicality, modernity and novelty to your recipes. Just like in the case of lentil and grass pea soup, and success – our word – is guaranteed! in a saucepan with 200 g of granulated sugar and a pinch of salt. Add the pasta, cook it according to the times shown on the package and drain. Melt the butter in a pan with the icing sugar, add the pasta and let it flavor, stirring, for about 30 seconds. Heat the almond milk in a saucepan, melt the cornstarch and a pinch of vanilla and cook for 3-4 minutes, until it is a little thickened. Grate the orange rind, peel it, remove the skin and cut the pulp into cubes. Cut the candied orange peel into small pieces. Melt 30 g of granulated sugar in a pan with 2 tablespoons of water; when it starts to change color, add a handful of pistachios and stir for 30-40 seconds. Spread the almond milk on the plates, then the half penne. Garnish with orange pulp, candied peel and pistachios. Complete with the grated rind and, to taste, with tufts of fennel and small meringues.